COLOR(S):Fawn with black mask, or a variety of colors. The Anatolian Shepherd is similar in looks to the Great Pyrenees with its dark nose, medium sized drop ears and brown, almond shaped eyes. This breed is more agile and has a tighter frame than the Great Pyrenees. Anatolian Shepherd dogs are known for their large, strong frame and their courage. They are bold and steady but never aggressive and will be loyal and keen on protection. This dog breed can reach up to 30 inches and other than their black mask and ears, come in a variety of colors from solid cream to fawn. As an intelligent breed, these dogs are independent and hardy and were at one time used to hunt wolves. Today, in the United States, Anatolian Shepherd dogs are often used as hunters, sheepdogs and in the military. They are very stern about their job and are rather protective, acting as if guarding is their main priority. They usually do not like strangers and owners often stress “this dog is not a gentle giant. Affectionate with family and friends, Anatolian Shepherds are laid back, easygoing and reliable. These dogs are independent, intelligent and calm but rather serious when it comes to guard duty. Even though they are devoted to their family, they are watchful and always alert making them suspicious of strangers. They are protective and territorial, so they should be properly introduced to any kind of stranger. Owners should post a sign for delivery people advising not to enter an Anatolian Shepherd dog’s space. Despite this guarding and protective nature, these dogs are loyal and trainable. They do not like living in small spaces but they are gentle and playful with family and children. Anatolian Shepherd puppies and dogs have a natural affinity for keeping themselves clean. With their furry coat, these dogs need a weekly brushing. This large breed of dogs is sensitive to anesthesia and can be prone to hip dysplasia. 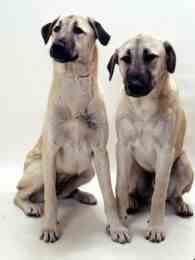 Anatolian Shepherds may also experience health problems such as hypothyroidism. As large dogs, Anatolian Shepherds enjoy having access to a large area where they can run free. They should receive daily exercise like a brisk run on a leash or a good long walk. Anatolian Shepherd puppies should be trained early to prevent future aversion of strangers when they are adults. To prevent boredom in this breed, mental stimulation is necessary.